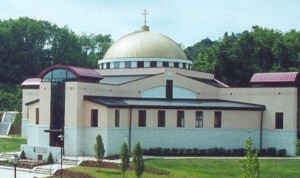 The Cathedral of St. John the Baptist in Munhall, Pa. is the “seat” of the Byzantine Catholic Archeparchy of Pittsburgh. The word “cathedral” actually is derived from the Greek noun ”cathedra” which literally means “seat” and refers to the presence of the archbishop’s or bishop’s chair or throne near the iconostasis (icon screen). A symbol of his high authority and official status as the leader of an archeparchy, a chair for the archbishop or bishop also exists in every church of every archeparchy. However, because the cathedral church space must accommodate archeparchy-wide events at which the archbishop or bishop presides, it stands to reason that it be large enough for increased numbers of people to gather for special liturgical celebrations and social events. For this reason, the Cathedral of St. John the Baptist moved from its former location in Homestead to its present address in Munhall on several acres of land which could accommodate not only the building of a new and larger cathedral but also a spacious social center.